Discovery Bay is located on Lantau island. This island is also the home of the world largest bronze cast outdoor sitting Buddha. That’s our aim for today. One more parcel to send home and another meeting with a foreign postal service. The Chinese post office was superb with great service, nice structure and everything organized. Quick in, quick out. Ben, it’s heading your way. Again. From the plaza we set a course for Mui Wo, another town here on the island. We have to cross a ‘mountain’ on our way, but we are prepared and have a nice trip over. Just outside the glossy and shiny party’s of Discovery Bay is another way of living. There are shacks and houses with no windows that give shelter and storage for people. The same people also have small gardens where they grow a lot of different vegetables. Fire beaters. No fire extinguisher as you’re used to. Beat it, just beat it. A look back towards Discovery Bay. Well across the mountain we found a tiny little place where we could get a cold drink. We stay for a little while and look at the beach and listen to the waves. So close to Hong Kong city, so very different life. Before we catch the bus from Mui Wo to the Buddha we get lunch at the local market. We order different dishes and when we ask the waiter if it’s enough food.”Plenty for three people”, she says and walk away. She’s right. We’re not near to finish it all, but it was good and a lot of different tastes. The we indulged ourselves with an ice cream at McDonald’s. It’s a guilty pleasure. Don’t judge me. Into the bus and up to the Buddha. Stepping off the bus we argue for five seconds wether to go left it right. Then Katja raises her eyes and said calmly;”it’s that way”, and points to the Buddha. It’s kinda hard to miss really. The Buddha is so large it’s insane. I don’t think the pictures will do it justice, but we took a lot of photos. We walked up to it and circled it as well. It’s so huge it blows me away. 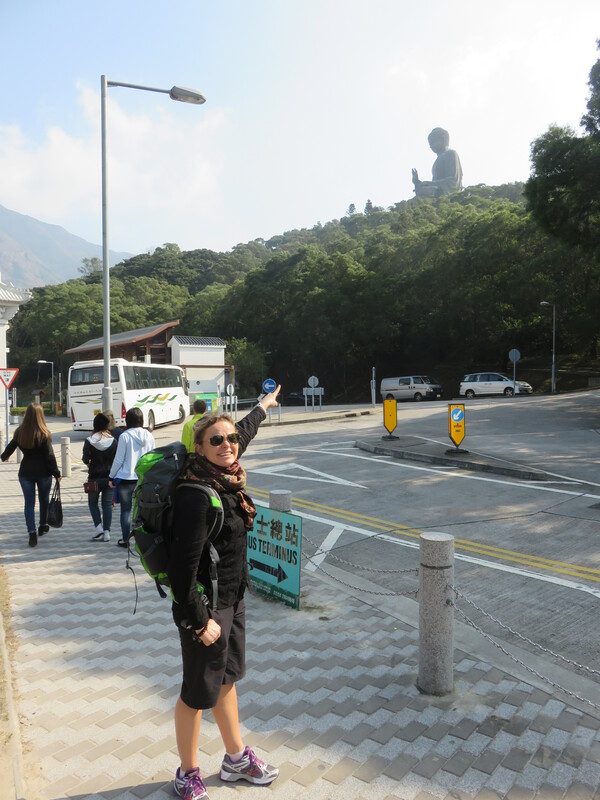 After spending some time there we went down and moved over towards the ‘house of ten thousand Buddha’s’. It happened to be a kind of ceremony there so we couldn’t get in. We watched from the outside and took some pictures of the procession as the exited the building before leaving. On the way down we used the cable car. It’s a 25 minute ride in the cable car down and we pass by the airport. It’s quite a view over the flat land they made for the airport. We see take offs and then turn abruptly right and move to the town of Tung Chung. We locate the bus to Discovery bay, and see it leaves often enough. We sit down at Starbucks and chill while enjoying a cup of coffee. We get some groceries and take the bus back to Discovery bay. Well back in the apartment we made dinner and did some light packing to prepare for tomorrow’s departure.